Adidas is no stranger to making quality shoes. They are a bonafide athletic apparel giant and has been making quality shoes for many different sports for decades. 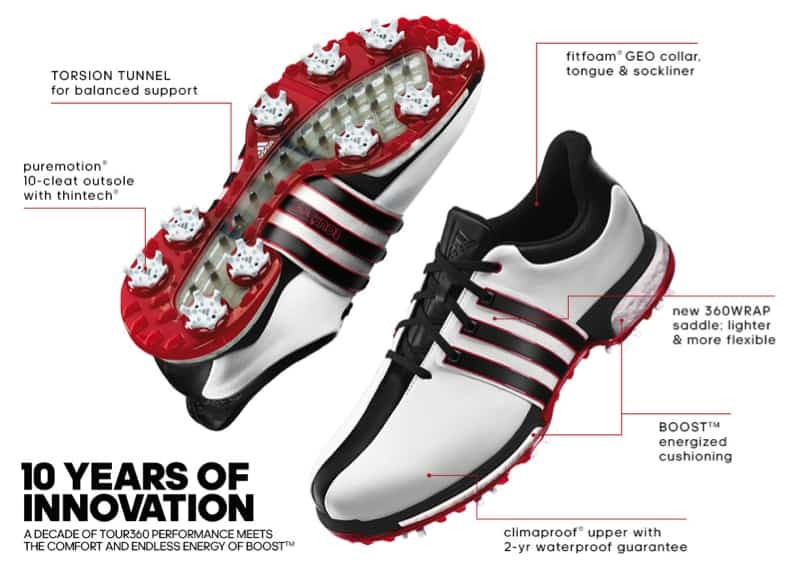 You or someone you know has probably owned a pair of Adidas, it’s no surprise that they also make phenomenal golf shoes. If you are looking for one of the best golf shoes out there to that will keep you foot comfortable for an entire round, the Adidas Golf TOUR360 Boost is a top pick. The Adidas TOUR360 golf shoe has been one of the best golf shoes on the market for a while. 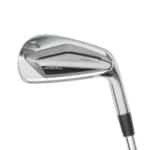 While the TOUR360 line has certainly changed over the last 10 years, they look remarkably similar to the original version. However, the original tour360 style golf shoe did not perform nearly as well as the Tour360. When a product is one of the best golf shoes for a decade, you can take comfort in its quality. To top it all off, you will receive a two year warranty upon purchase. 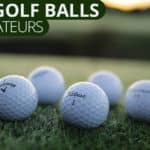 Even an athletic and fit golfer is likely to feel tired at the end of a long day on the golf course. If you’re like us and prefer to walk golf courses when you play, you’ll appreciate the comfort provided by the ‘Boost Foam’ in this golf shoe. Boost Foam is used to pad the heel and forefoot of these golf shoes. Fatigue in your feet can distract you when playing a round and can quickly lead to poor play on the golf course. With the Boost Foam cushioning, your feet will be more comfortable for a longer period of time. In addition to being more comfortable, the new Tour360 Boost golf shoe is also more flexible than its predecessors. Because of the complex movements that the foot makes during the golf swing, flexibility may be more important than you think. With the combination of the 360 wrap saddle in the heel portion of the shoe and the Torsion Tunnel, the new Tour 360 offers you plenty of stability without feeling like a stiff board. As we mentioned before, these golf shoes are made with full-grain leather on the upper sole. They also feature Adidas climaproof technology, which makes them hold up very well in wet conditions. 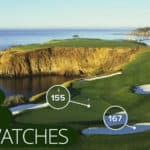 If you play in a climate where it rains frequently, these shoes are some of the best golf shoes for those conditions. In addition to being great for wet conditions, these shoes also feature ten separate cleat grips for great grip. 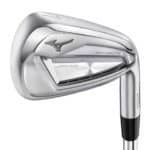 In wet conditions this allows you to swing as hard as you would in dry weather without the risk of slipping and ruining your shot. As soon as the cleats wear out, you can easily order replacement cleats at a low cost. Is this the best golf shoe for you? These shoes are some of the best golf shoes out there for golfers looking for shoes that hold up well in wet conditions and have great grip. These shoes are highly rated and have stood the test of time with over ten years worth of variations on a great product. 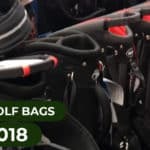 What makes this an even better deal is that the price is great when compared to other high quality golf shoes on the market. 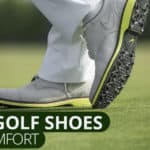 If you don’t want to bust your budget, but want comfortable and dependable waterproof shoes, these are the best golf shoes for you.